Please note: This chalet can only be booked for a group taking sole occupancy (unless within 6 weeks of departure date). Children under 15 are not allowed in this chalet on any date, unless part of a group booking the whole chalet. As part of the Mountain Collection, Chalet Le Blanc offers free ski guiding and coaching with fully qualified Mountain Expert ski and snowboard instructors. Various sessions run throughout the week to introduce you to the ski area and improve your technique along the way. Skiers and snowboarders wishing to take part need to be over 18 (or 12 in school holidays) and be good enough to ski down blue and red pistes. You can sign up for the sessions at the chalet on your first day in resort. The Lac Blanc sits on its own like an island in the middle of the piste, right next to one of the main lifts in the resort; the DMC gondola. With its identical twin sister chalet taking up the other half of the building, and a snack bar underneath, convenience really is king here. It's so convenient, popping in from the slopes for a cuppa or even just a quick break is easy. After skiing or boarding right up to the door, head up the stairs past the equipment storage and boot warmers, turn left and you're straight into the modern looking lounge/diner. The first thing that hits you is the large windows and wrap-around balcony which looks out over the resort and slopes. The choice of lifts within 100m of the chalet door includes the two-stage DMC gondola which takes you to 2700m or a series of drag lifts. Having this choice makes the Lac Blanc a good option for any level of skier. Sleeps up to 14 people. Most of the seven twin or double rooms are ensuite with comfy beds and plenty of light. Some share a balcony and have views out across the resort and slopes. Located above a piste-side restaurant that is only open in the daytime, you access the chalet by an enclosed staircase at the rear of the chalets. Ground floor: Ski & boot storage area with boot warmers. First floor: Open plan dining and living area with comfortable seating, satellite TV, DVD player and kitchen area. Second floor: Five twin or double bedded rooms (please specify at the time of booking), two of which share a balcony, all have shower and wc. One twin room is larger. Third floor: Two twin or double rooms sharing a shower and wc. These are attic style rooms with a sloping ceiling. We stayed at the Chalet Le Lac Blanc at the end of March 2011. The chalet itself was well run by the host, Lucy, and was good value for money — especially with the 2 for 1 ski pass deal. For being on the slopes the location was second to none. Literally ski into the front door. The rooms were cramped, we had the smallest at the top of the chalet, I suppose luck of the draw. 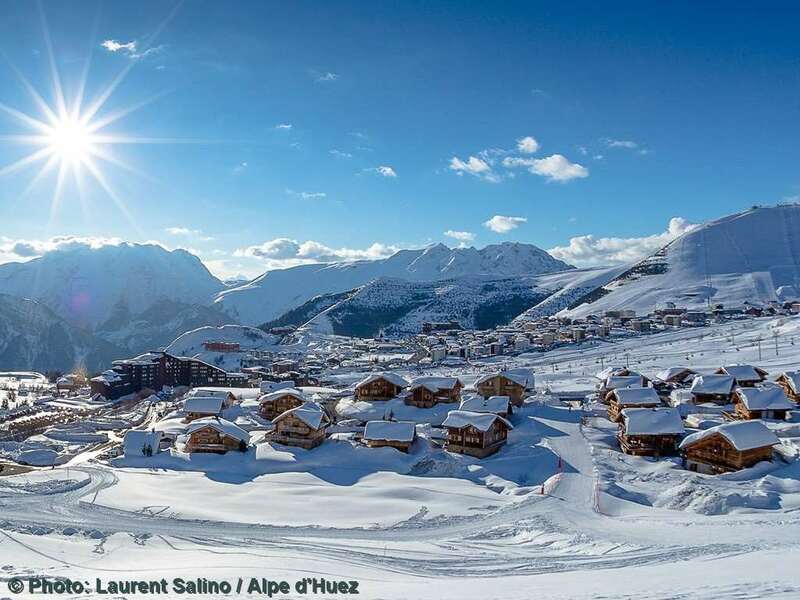 The skiing itself was limited, due to the warm weather, the snow — 30cm fell while we were there — was disappearing very quickly and despite the height of Alpe D'Huez many of the lower pistes were closed or closing. The glacier had the best skiing but unless you fancied the challenging "Tunnel" route down, the alternative was to cable car down. The resort is probably best up until start of March. We spent one day in Les Deux Alpes which had much better conditions and better lift infrastructure.